Welcome to my Blog, a great place for dog-lovers from all dog-walks of life. To learn more about my work and National Dog Week, please see ABOUT! With thoughts on Japan, National Dog Day has encouraged those who wish to help the animals of that nation to go to http://www.animalmiraclenetwork.com. As a blogger of all things dog, I am always on the alert for local Rover-related topics for positive pet-related posts. This year, I am lucky again to be in the Florida Keys for the Second Annual Woofstock Festival to be held at Founders Park in Islamorada (mm 87) on Saturday, March 19 from 11:00am-7:00pm. Woofstock is billed as a “Far Out Festival Filled with Music, Food, Beer…” and of course scads of scalliwags, masses of mixed-breeds and parades of pedigrees. Last year’s event was a great success with over 500 dogs accompanied by over 1,000 humans. (See my coverage in Blog Archives of March 9, 2010-By the Time we got to Woofstock). This year, Woodfstock proves to be even more special with lots of local entertainment performing up on the acoustic stage and over 85 booths of pet-related vendors, businesses and organizations. At the heart of Woofstock is the desire to help shelter pets in a fun and rewarding way. Founders of the event, Michele Beach and Joy Martin have had significant success in rehoming hundreds of cats and dogs through the Marr-Velous Pet Rescue organization in the Upper Keys (http://www.marrvelouspetrescue.org). This shelter thrives through the use of the “inter-pet” and “social petworking” sites like Facebook which helps them create a virtual shelter with pets being cared for by foster homes rather than actual brick-and-mortar shelters. These fosters, in several states, are also supported by substitute foster families who fill in the gaps by caring for pets when foster families need weekend or vacation back-up (a great way for families to care for a dog without commitment). Events like Woofstock raise funds for the care and feeding of these animals. Like last year’s event, Woofstock will feature adoptable dogs and pups (some breed-specific) and for those cat lovers, kitties needing “purr-manent” homes will be made available through organizations like Forgotten Felines and Caring for Cats. This year’s event will again offer interesting and educational demonstrations like Lure Coursing, K-9 CPR Training, K-9 Search and Rescue as well as a Blessing of the Pets. New this time around is Dog Dock Diving with Ultimate Air Dogs (something I think my water dog, Hooper might like). 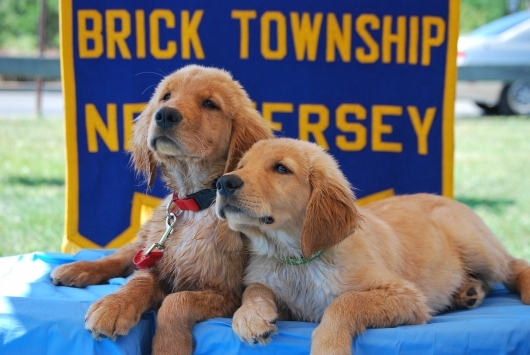 As you may recall, last September (on the first day of National Dog Week) my community of Brick Township held their first-ever DogFest on the banks of the Metedoconk River at Windward Park. Like Woofstock, this event was so successful, that plans are in progress for their 2nd Annual event on September 18 of this year. You can read more about last year’s event in the Blog Archives of September 28, 2010. Sponsored again by the Brick Rotarians, Bark Fest 2011 plans to be bigger and better this Fall. For details, or to participate, please go to their Blog at http://brickdogfest.wordpress.com. These events are more than just a walk in the dog park. Both these dog-friendly days offer an opportunity for dog owners to meet and share experiences, learning about products and services that strengthen the bond between them and the dogs they love. This is what Will Judy had in mind when in 1928, he set aside the last week in September and declared it National Dog Week. Events like Woofstock, Bark Fest, and others make sure that every dog gets its day, and hopefully come September – a week! If you have a dog event, or are planning a dog week event in September, please let me know about it! Contact me at pst39crd@aol.com. To read more about Woofstock, please see their site at http://www.keyswoofstock.com.